I still remember the nervousness I felt when I posted my first recipe. 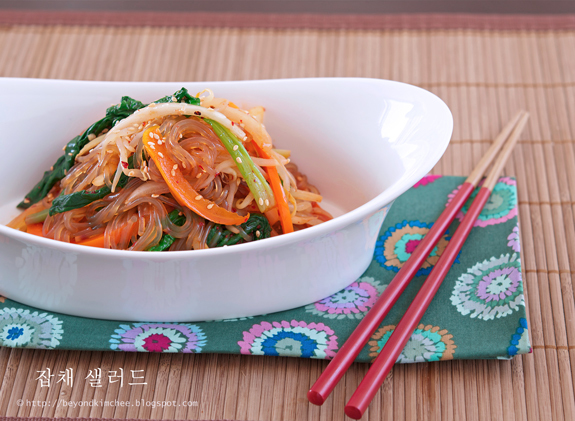 It was the Japchae, the famous Korean noodles. 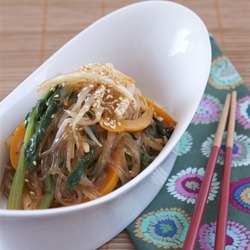 Miraculously people have been finding my blog ever since, in search of good Korean food recipe, and my original attempt of making this blog into personal recipe collection for my children has come this far. Thanks to all of you for the support and the encouragement. I love Japcahe but making it can be quite daunting with all the work involved in each ingredient. So I put a twist on this noodle dish and made into simple salad that can be prepared quite fast. Perfect fit for a spring salad! 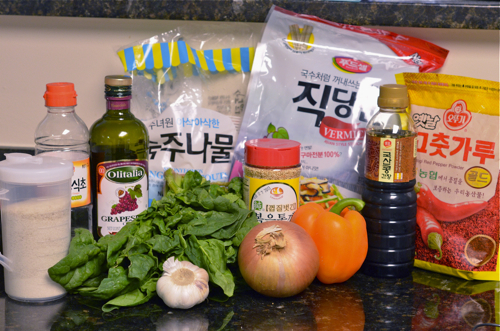 The addition of Korean chili vinaigrette gives completely different flavor than traditional recipe and offers amazing flavor and texture balance among all the ingredients. Boy! 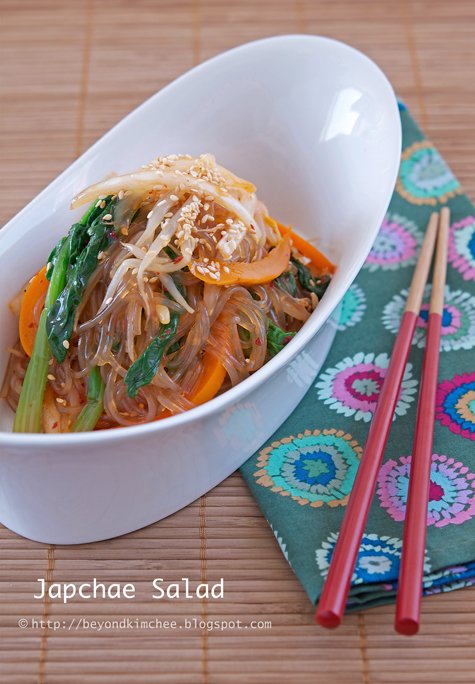 It turned out so good that I am going to replace this recipe with all my traditional Japchae request from my dinner guests from now on. Hey, I am an old fashioned southern gal with traditional value of life, but I do think revolution is necessary, even in the food. Here are what you need. Japcahe noodles, spinach, mung bean sprouts, orange pepper, onion, garlic, soy sauce, sugar, Korean chili flakes, grape seed oil, sugar, vinegar, and pepper. 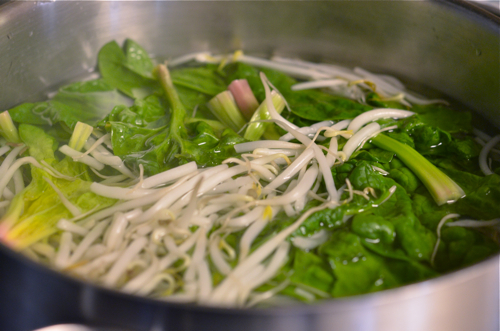 Boil a pot of water first and add spinach and mung bean sprouts together, blanch them for 5 seconds. One Mississippi, two Mississippi… five Mississippi, Done! Take them out from the pot and rinse with cold water. Gently squeeze out the water from them with your hands. Set aside. 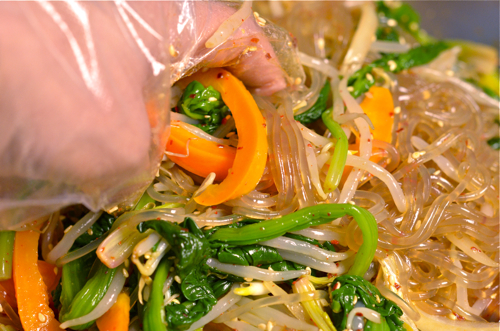 Now, cook the Japchae noodle (aka Dangmeon, sweet potato noodles) according to the package direction. It usually takes about 6-7 minutes. 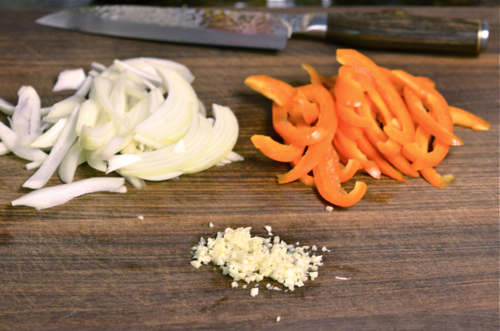 Slice the onion and the pepper, chop garlic. In the skillet heat 2 tsp oil and saute garlic, onion, and pepper for 1-2 minutes. Remove the skillet from heat and set aside. This is an optional step. If you don’t mind biting on to the raw onions you can skip this. 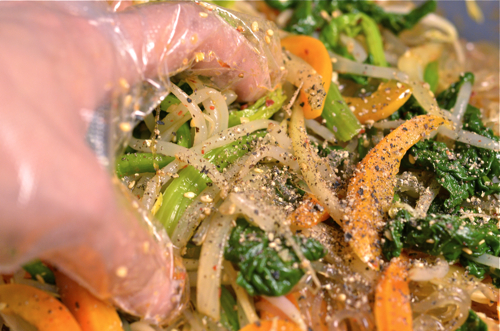 Quick sauteing will help them to be milder in flavor and texture, but still retain their crispness. 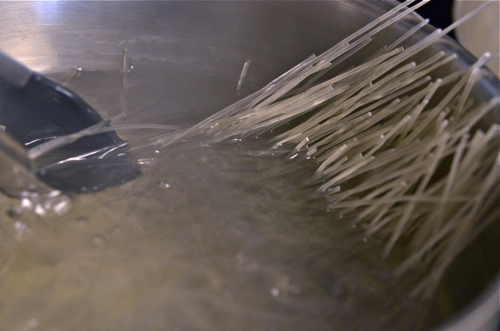 When the noodles are done, shower them with cold water and drain well. My noodles were pre-cut in the package. If yours are not, you might want to give them a few cuts before you move on to the next step. 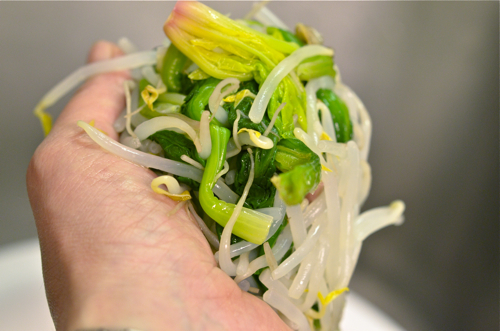 Bring all the vegetables and noodles in the skillet, pour the dressing over. USE your hand! Gently mix everything together as if you are massaging them by gently tossing and squeezing until everyone in the skillet is all mingled. Sprinkle some freshly ground pepper and toss well. 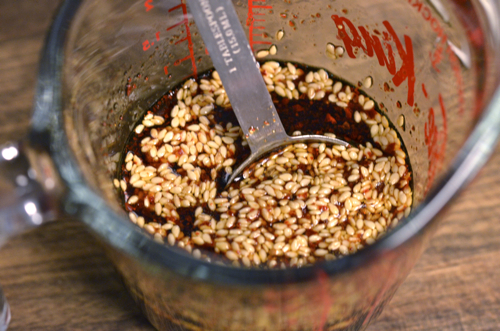 You can drizzle some sesame oil, too, if you wish. Now the salad is ready to serve. Super duper healthy as you can tell. This is a keeper, y’all! 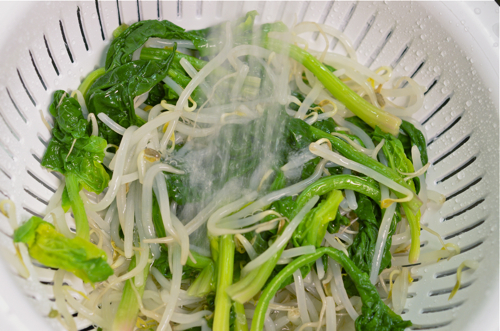 Blanch spinach and mung bean sprouts together in the boiling water for 5 seconds, rinse them with cold water, squeeze the water out. Set aside. Make the vinaigrette dressing with given ingredients. Cook noodles according to the package direction, about 6-7 minutes. 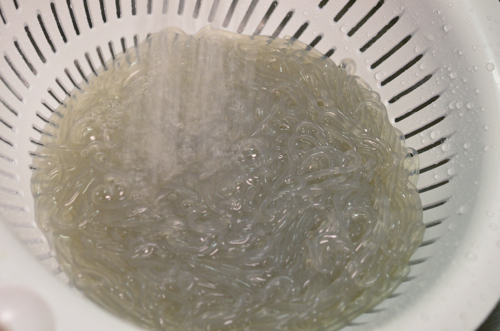 Rinse with cold water and drain well. Cut the noodles if you wish. Set aside. Heat 2 tsp oil in the skillet over medium heat and saute onion, garlic, and pepper for 1-2 minutes until they get slightly wilted. Remove the skillet from the heat. Add all the vegetables and noodles in the skillet. 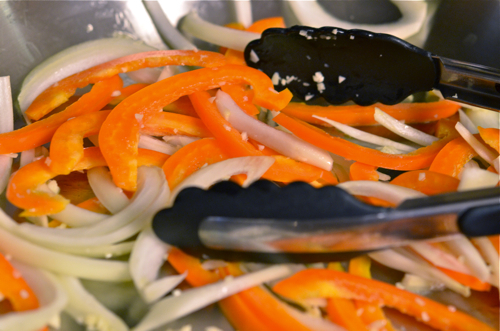 Pour the dressing over and toss with your hand as you gently massage everything to combine. lovely twist on such a classic favourite! yum, the vinaigrette reminds me of your pan-fried tofu recipe (a fave of mine). Can't wait to try this! Thanks. Hope you can try soon and let me know how it turned out. I am so going to make this! I believe the vinaigrette would be very versatile. Yes, you can use this vinaigrette to make other types of salad as well. I've made this twice now, and love it. I use up whatever veggies I have that would be good in stir-fry, and replaced spinach with garden chard and added snow peas. You know, I could eat the whole portion myself, too. LOL! I am glad that you liked the dish. Thanks! May i know what kind of soy sauce to use? Light, dark, korean, chinese? 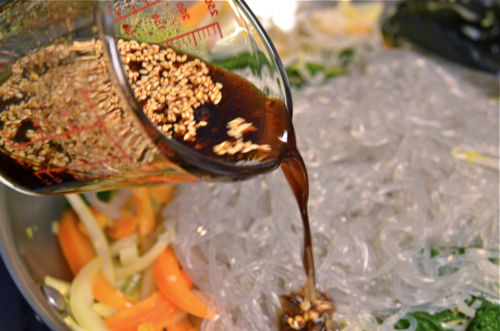 regular Korean soy sauce, but Japanese soy sauce would work, too.